Comp showing text and building wireframe, per sketch 2 below. I still need to incorporate details and a color scheme and things like that. I used this simple dark background to show the text treatment I had in mind. 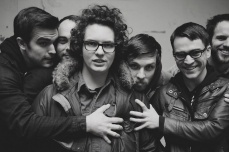 I've chosen the Seattle band Pickwick and their show at the Mercury Lounge in New York in April. Their songs can at the same time be upbeat and cover somber topics and are vague enough to leave the ultimate interpretation up to the listener, which they have indicated that they do on purpose. They even released a series of EPs entitled "Myths." Instrumentally, their music tends to be raw and driving. I had some trouble with the concept and found the first lecture extremely helpful. I wanted to somehow capture the emotion in their music and went nowhere until I decided to include New York City in the concept. It's gritty and inspiring and sad, much like Pickwick's music. Below are two sketches. The first is based on a boombox, a symbol of raw, unfiltered music in New York City. I incorporated the Washington state outline into the tape deck. Other than that, just illustration and typography. The second sketch is thus far my preferred concept: a man being chased down a fire escape. The idea is to have it be raining (reference to Seattle) and generally dark & gloomy (reference to the music). There is also an exhilirating feeling in the chase and intrigue because you don't actually know why the guy is being chased, both references to their music. The building I intend to illustrate is the one in which the Mercury Lounge is located. Visual references below include some styles I like for this, the band's current tour poster and the aforementioned building. Feedback welcome. Thanks.